Los Angeles, Calif. (January 20, 2015) – Based on the popular and much buzzed-about book The Street Sweeper by Tim Enochs, Welcome to Inspiration brings a small town to life on the big screen. 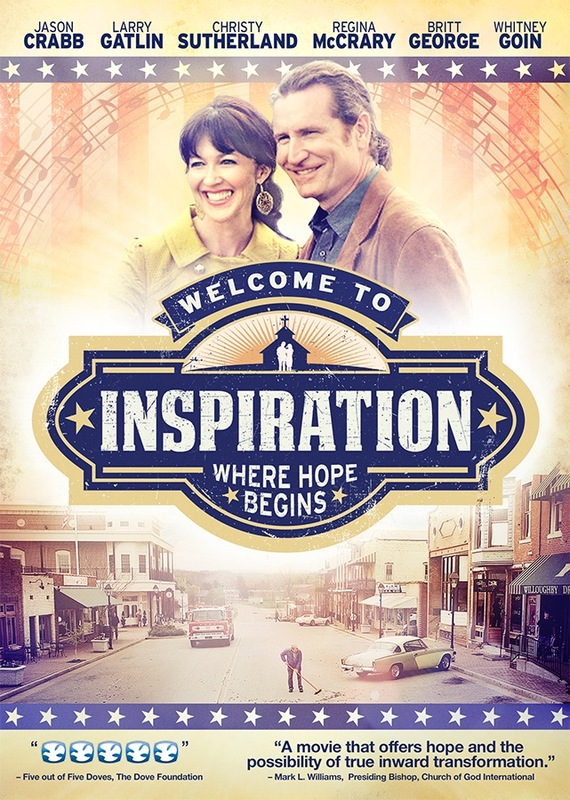 Releasing today, January 20 to DVD, Welcome to Inspiration is a family film with a musical heart starring a cast of well-known Christian and country artists, including GRAMMY® Award-winners Jason Crabb and Larry Gatlin, as well as Contemporary Christian artist Christy Sutherland. Additional cast members include Jackie Stewart (Slingblade, A Time to Kill) as The Street Sweeper and Regina McCrary of The McCrary Sisters. Welcome to Inspiration follows the true-to-life story lines of people searching for meaning in the midst of unfulfilled dreams, challenging circumstances and unexpected struggles. When a big city couple find themselves stranded in a small town, their lives are changed forever. A chance encounter with a Street Sweeper opens their eyes to inspirational life lessons that come alive through the town’s residents: a widow coping with the death of her soldier daughter, a small business owner rescuing a young runaway, a mechanic finding faith and a young musician bravely pursuing his dream. Like Enochs’ book, the movie reveals seven Bible-based principles, which Enochs dubs the “Seven Revelations of Irrefutable Success” that point toward a life of increased spiritual fulfillment. With themes of faith, family and discipleship, Welcome to Inspiration points viewers to the Word of God as the source of ultimate authority and direction. The film effectively moves audiences to spark personal spiritual journeys, using drama, music and emotion to seek Scripture for use in daily life. When living in Inspiration a child, a marriage , even an entire town can be saved because with God all things are possible (Matthew19:26). With the DVD’s release, fans have the opportunity to join the Inspiration community online www.WelcomeToInspiration.com sharing their stories of how God has used a “Street Sweeper” in their own life to guide them toward biblical truth. Fans have already uploaded videos of personal testimonies, sharing the work God has done in their unique circumstances. In addition, the website provides complimentary resources for churches, charities and small groups. Welcome to Inspiration also places an emphasis on powerful music scored throughout the movie and features live performances from a diverse line-up of artists including Grammy Winners Jason Crabb and Larry Gatlin, Christy Sutherland, Regina McCrary (The McCrary Sisters), Andrew Greer, Andrea Thomas, Kaitlyn King, Terri Sharp and a themed score by Mike Viola (That Thing You Do, Walk Hard). For Our Father Films, LLC is a company formed out of a unique dream! A film company with a community focus, For Our Father Films, joins the ranks of filmmakers in the great journey of faith and family media. By developing and producing God honoring content, creating storytelling with a purpose and seeking unique “out of the box” partnerships, For Our Father Films proves to have impact and is working to become a pillar in the faith film community. What began as a dream to help one church reach others has exploded into a mission to reach millions. They currently have multiple faith projects in development. Tim Enochs is the author of The Street Sweeper which inspired the film Welcome to Inspiration. His other three books include Every Day is Game Day, The CHILD Game Plan (with Bruce Tollner), and Uncommon Influence (with Kevin Harrison). Tim has taught Sunday School for over twenty years and is an avid saxophone player. He has been an Executive Business and Life Coach with Building Champions for thirteen years. He is passionate about following the 7 Revelations and helping people discover their purpose, set clear and compelling goals, and focus on the appropriate action necessary to achieve those goals in their life and business. He shares these practices with groups across the U.S. throughout the year. Tim was the first Citizen of Inspiration! ABOUT CAPITOL CHRISTIAN DISTRIBUTION: Capitol Christian Distribution is the market leader in Christian and Gospel music distribution and represents a diverse range of chart-topping Christian films and books reaching the U.S. Christian and general retail marketplace, and the international Christian marketplace. Since this distribution division was launched, Capitol Christian has had more charting titles annually on Billboard’s Top Christian charts than any other Christian distributor and has been named Billboard Magazine’s Top Christian Music Distributor 15 times since 1995. For additional information, visit http://www.capitolchristiandistribution.com.